Posted on February 27, 2009 by Digital Sensei Comments1 Comment on Linux! make me a sandwich!! Linux! make me a sandwich!! We have always wondered, can we get our computer to make us a sandwich? Until now that was impossible with only a Persocom. But thanks to the brilliantness of DIY Maker guru Bre Pettis. 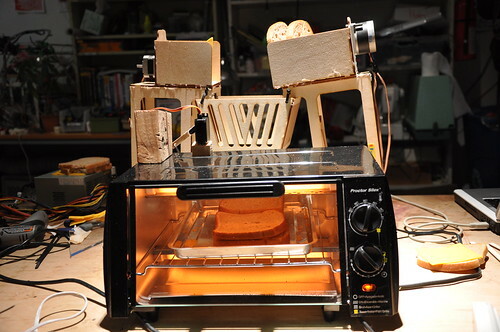 From the Bre Pettis Blog article Sudo Make Me A Sandwich we learn how to build our own sandwich machine that can connect to our Linux box and make a smashing grill cheese sandwich. This robot was inspired by XKCD, a wonderful webcomic that appears to have some sort of window into my head. I swear I think of things and the next day, there is an XKCD comic about it. This entry was posted in DIY, Hardware, Tips and Tricks. Bookmark the permalink.